The MTA has agreed to tear out the massive granite barricades ringing the Long Island Rail Road’s Atlantic Terminal, finally admitting that the concrete coffins at the borough’s largest transit hub were excessive and ugly. Starting in February, the Metropolitan Transportation Authority will rip out the 14 stone sarcophagi and replace them with a series of short metal bollards at the entrance to the $106-million Atlantic Terminal, which opened to immediate criticism in January, 2010. MTA spokesman Sal Arena acknowledged that the stunning reversal was a response to outcry over the massive security perimeter. 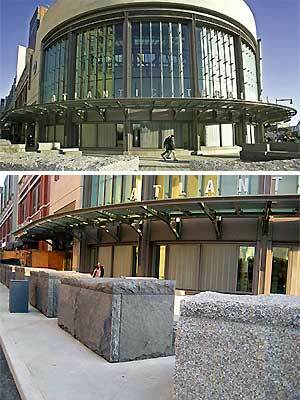 “The new, smaller bollards are less intrusive and more acceptable to the community,” Arena said. I suspect there's another reason for the bollard switch: by eliminating wide bollards that slow people down but don't add significant safety regarding vehicle intrusion, travelers will be able to get into and out from the station much faster. And that would be necessary to accommodate those visiting the nearby arena scheduled to open in about a year. Note that smaller metal bollards are also planned for the perimeter of the Atlantic Yards arena site.